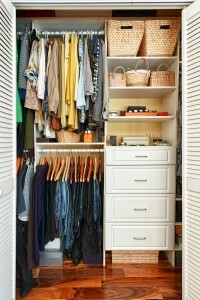 Are your closets a jumbled mess? Are you tired of pulling and shoving hanging clothes aside to find the shirt or dress you need? Are cereal boxes constantly toppling from the crowded shelves of your kitchen pantry? At 31-W Insulation, we understand your frustrations. That’s why, as the leading home improvement company in the Louisville area, we offer and install closet organizer systems that help homeowners declutter their closets and maximize their storage space. 31-W is committed to providing homeowners with the best value for their home improvement dollar, which is why we source our closet organizers from ClosetMaid, a trusted name in home storage. With one of these sturdy shelving systems in your home, you’ll have a practical storage solution that can last for many years. Contact us for more information about our versatile closet organizer systems. We’d be happy to schedule a free consultation for one of our highly trained and experienced team members to come to your Louisville home, assess your storage needs, and help you design an affordable solution.